As the body ages, the resulting changes can lead to certain conditions, one of them being venous leg ulcers. There is a one in fifty chance you will be subjected to venous leg ulcers by the time you reach the age of eighty. The most common area for this condition to form is somewhere on your legs. Your skin will lose elasticity as your body ages. When your skin breaks down in a specific area, the result is often a skin ulcer. When this happens, the underlying layers of skin become visible. The area right above your ankles is the most common location for the formation of a venous skin ulceration. This condition is much less common for men than women. The majority of ulcers are relatively painless. This being said, some ulcers are very painful. This is especially true of a venous ulceration in an area where a lot of friction occurs including your sock or shoe line. If you do not receive treatment for your ulcer, there is a possibility it will become infected, increase in size or cause additional issues with your leg. In some cases, there can be an inflammation of the skin around the ulcer. The most common cause of a venous leg ulcer is circulation. When the blood pressure increases in your lower legs, it can result in venous ulcerations. When blood begins to collect in the smaller veins, additional pressure is added to the veins in your legs. This can be caused by numerous conditions including blood clots, damaged vein valves and varicose veins. Gravity will cause your blood flow to go down your legs. This results in the creation of pools of blood that will add additional pressure to your legs. In some cases, this pressure is strong enough to cause fluid to ooze out of the veins right under your skin. This causes a thickening and swelling that will eventually damage your skin. When the skin on the surface becomes damaged, it can breakdown. This will cause the formation of a venous leg ulcer. Venous ulcerations are a condition that requires a different type of treatment for each individual case. The treatment is specific and dependent on the exact issues regarding the legs. In some cases, your ulcer can be effectively treated using a combination of a good washing, plenty of rest, clean dressings and ensuring your leg is elevated for thirty minute intervals several times every day. Under certain circumstances, adding a compression bandage can help accelerate the healing process. A good example is an ulcer caused by faulty veins. Treatment would be required for the venous leg ulcers. If the case is extreme enough, detailed imaging may be necessary for the creation of a map of your leg’s circulatory system. The goal of advanced therapy is providing numerous treatments for both varicose veins and venous leg ulcerations in a professional and caring manner. There are currently a fairly wide selection of treatment options available specifically for venous leg ulcers. If this condition is not treated, the ulcers can cause extreme pain, restrict your lifestyle and decrease your level of activity. 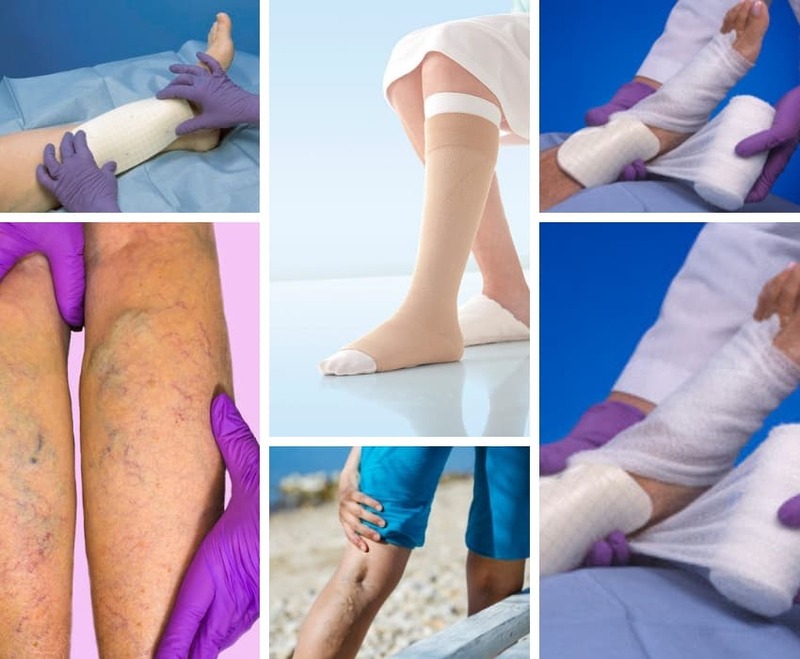 There are modern treatments available to help you treat and conquer venous leg ulcers. Many individuals are living an active lifestyle, do not have many periods of free time and continually delay their treatment. This will eventually cause an increase in the level of discomfort and pain. The advancements made in modern medicine have made the treatments both more comfortable and faster than in the past. Most of the treatments are available on an outpatient basis, are minimally invasive and have a shorter period of downtime. Certain treatments will require you to wear compression stockings, while others will not. The specifics of your treatment are dependent on your exact condition. There are a lot of reasons patients deliberately delay their treatment for venous leg ulcers. The most common reason is the concern for a high level of pain in the legs. Venaseal treatment decreases the pain level by decreasing the number of punctures necessary to access the impacted veins. The physician only has to make one puncture point to access all of the necessary veins. The physician guides a soft, small tube to your leg’s upper sections. The vein is then sealed closed with the administration of medical glue. The seal is completed where the glue was injected using manual compression. The sensation is very similar to what is experienced when having a massage. Other treatments for venous ulcerations require both heat and tumescent anaesthesia to make certain you remain comfortable during the treatment. Unfortunately, this often requires multiple pricks using needles. This may result in the possibility of nerve damage and additional bruising. Venaseal treatment does not require heat. This eliminates the need to use numerous punctures as well as the most common side effects. Most individuals either feel no pain or minimal pain during the treatment. The most common sensation is a pressure throughout the area being treated. One of the key benefits for this treatment is once the procedure has been completed, you are able to return to your regular daily activities. The length or lack of downtime is dependent on the treatment used. Compression stockings are not required after a Venaseal treatment has been completed. There are certain individuals who experience high levels of anxiety prior to the treatment. In these cases, the patients will be given anti-anxiety medication. It is important to note this medication will extend the recovery period. The most common side effects for treating venous leg ulcers include a slight bruising and tenderness and mild pain. These symptoms can usually be handled with an over the counter pain medication. This treatment option is appropriate for men, women and physically active individuals. This is one of the quickest treatments and was created to be as comfortable as possible for the patient. All of the options listed above are non-invasive and have a high rate of success. Each treatment is very different, but the results are similar. A consultation with a physician is required to determine the best treatment for each individual condition. This is a non-invasive and common treatment to remove varicose veins. The treatment begins by inserting a thin fiber into the vein. This emits a wave of light and provides a small amount of energy for the area affected. This causes the vein to reseal and close so the blood can be rerouted to the healthy veins. A local anaesthetic is provided before the procedure begins to keep the patient comfortable. The majority of patients experience a low level of discomfort. A little bruising and tenderness after the treatment are common. This treatment is both non-invasive and effective for venous disorders. Needle punctures or tiny incisions are made to target the veins. The physician is able to use local anaesthesia due to the micro size of the incisions. This ensures the patient remains comfortable during the treatment. Stitches are not necessary and upon completion of the procedure, a compression wrap is used for the leg of the patient. There is a possibility of swelling, but the recovery period is usually fast and the individual can walk again as soon as the procedure is complete. One of the cutting edge treatments is RFA. Radiofrequency energy is used for the procedure. A small incision is made during the procedure so an extremely small catheter can be inserted. A burst of energy is then delivered through the vein. This causes the collagen to contract in the walls of the veins. The veins contract, collapse and then seal. The blood can then be sent to the healthy veins. Patients often experience mild swelling, bruising and tenderness. The recovery is fairly comfortable and fast. This procedure is when an injection containing a foamy, sterile solution is injected with an extremely fine needle into the affected veins. This results in an irritation causing the veins to shrink. Eventually, the vein will close. Multiple treatments are required for certain cases. This is an outpatient procedure with very few or no side effects. According to the estimates, one in every 500 people in the United Kingdom is affected by venous leg ulcers. This condition is more common among older individuals. Approximately one in every fifty people above the age of eighty have a venous leg ulcer. The risk is greater if the individual has previously experience DVT or deep vein thrombosis or if there are walking difficulties due to paralysis, a leg injury, osteoarthritis or obesity. The risk also increases for individuals having recently had surgery on their leg like a knee replacement or a hip replacement. Individuals with swollen veins, enlarged veins and varicose veins are also at a higher risk for the development of venous leg ulcers. If a medical professional treats the venous leg ulcers, healing is usually experienced within three to four months for the majority of cases. The most common treatment is compression therapy. It is important to note some ulcers require a lengthier period to heal and some never heal. The average treatment begins by cleaning and dressing the venous leg ulcer. A form of compression including stockings or bandages are used to improve the blood flow in the legs. If the ulcer is infected, antibiotics may be necessary. This will fight the infection but it will not help the ulcer heal. If the underlying cause of the venous leg ulcer is not addressed, the chances of the ulcer returning after treatment are high. The potential underlying causes include varicose veins, previous DVT, obesity and immobility. There are numerous ways to help prevent a venous leg ulcer from developing for individuals at risk. This includes losing any excess weight, wearing compression stockings, elevating the leg whenever possible and regular exercise. If the individual has already had a venous leg ulcer, these measures are extremely important. This is because the risk of developing another venous leg ulcer is higher for months or years for the affected leg. When a venous disease reoccurs it is often disheartening. Nearly all of the available treatments are minimally invasive and have either a short period of recovery or no recovery time is necessary. In most cases, the individual can either resume their regular activities immediately or fairly quickly. Some people do feel a little discomfort during some of the treatments, but the success rate is extremely high. Venous diseases will have a negative impact on the quality of anyone’s life. The combination of small changes in lifestyle and modern treatments will usually resolve the issue. The individual will be able to achieve healthy circulation, beautiful legs and an active lifestyle.